PRODUCT DESCRIPTION: Cage which measures 6 inches tall by 13 inches wide by 14 inches long. It has a door on the top which enables you to place live bait like birds or squirrels inside. A solid bottom helps to minimize stress to the bait which keeps it alive that much longer. WHERE TO USE IT: We install these when ordered and ship them ready to use. The size is perfect for the LT152248RD trap, which features the sliding rear door. 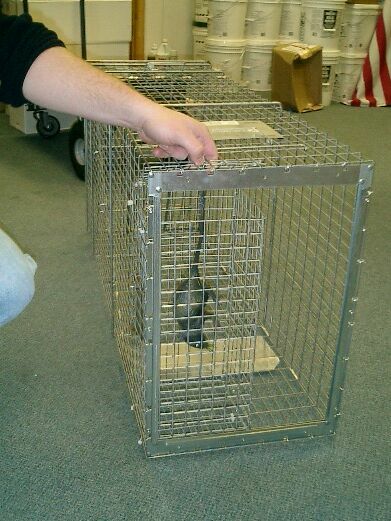 If desired, this Bait Cage can be removed in the future and the LT152248RD can be used without the Bait Cage like a more traditional trap. 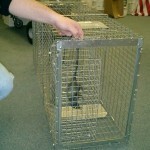 But when trying to trap a fox, coyote or bobcat, the use of a live bait cage is almost always needed. This is especially true when the animal is a lone male, a mother with young or any mature animal. COMMONLY USED IN THE FOLLOWING TRAPS: LIVE TRAP 15" X 22" X 48" LIVE TRAP 20" X 28" X 60" LIVE TRAP 20" X 28" X 72"
$30.00 (822015) 6" x 13" x 14"